What's the Best Time To Tweet? Maximize your Tweet exposure by coordinating with worker's downtimes. Part of a cohesive conversion marketing strategy involves the use of social media. Twitter is arguably the service with the most cachet at present and can be used as an effective way to build a network of interested customers. 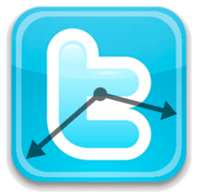 But does the time when you Tweet have an effect on the penetration of your marketing message? My thinking is that you want to catch people when they are most likely to be accessing the service. Think about your own Twitter interaction while at work. You probably take a look first thing while you are checking your email. Then when you come back from lunch and are lazily digesting the contents of your stomach, you may be tempted to do a bit more Tweeting and Facebooking. Finally, at the end of the day when work is winding down. This post by Gary McCaffrey shows some good detail on the subject and supports my hypothesis with a decent degree of accuracy. It shows that from 8am-3pm (PST) you are likely to get more attention. I think that this probably correlates with the break times as they shift from time zone to time zone. Clearly, there is evidence that you can spend a good portion of the day effectively tweeting. But if you had to pick just one, what would it be and why? You are effectively hitting 3 epicenters at the core break times. People are arriving at work on the West Coast; Vancouver, Seattle, LA etc. Guy Kawasaki was quoted saying that once you have a large number of followers on Twitter you should test tweeting your message several times throughout the day. Tip 9: Repeat your tweets. Try this experiment: take your most interesting tweets (as measured by how many people retweet them, perhaps) and post them again three times, eight to twelve hours apart. I used to think that people would complain about repeating tweets, but I’ve never had a complaint. My theory is that the volume of tweets is so high and most people check in at about the same time every day, so people don’t notice repeat tweets. According to a report in Fast Company magazine, 4pm EST on a Friday is the best time to get re-tweeted. Run your own tests and create a list of the most effective times for you. It’s part social dynamics, part timing and partly to do with the type of content you are sharing, so there are set rules, just guidelines.